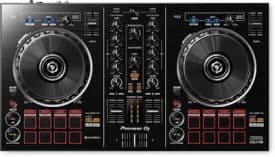 The entry-level DDJ-RB is inspired by Pioneer’s professional controllers for rekordbox dj, the DDJ-RZ and DDJ-RX. This USB-powered, 2-channel controller is all you need to get started with our rekordbox dj performance software. Perfected for use on the move, the DDJ-RB is a compact, lightweight controller packed with advanced features. It has an intuitive layout, responsive jog wheels and tactile Performance Pads that let you trigger Hot Cues, Pad FX, Slicer and Sampler. Plus a button to call up sample sequences directly from the hardware. Bundled with the rekordbox dj license key, simply activate your license key for our DJ software, connect the controller and start DJing.